You could say Werner Ostmann was racing against the cold one week before Thanksgiving. In the backseat of his silver Toyota Corolla, 30 sloppy joe sandwiches — paired with string beans and butternut squash — steamed up inside their plastic containers as he navigated the streets of Burlington’s Old North End. On the door of one North Champlain Street apartment, a sign warned visitors against letting the cat out. 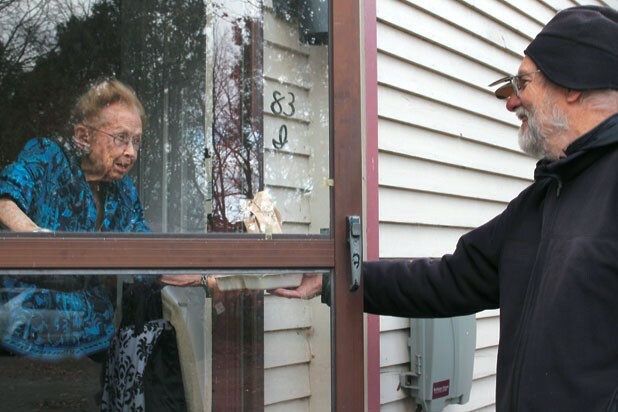 Ostmann knocked and called out, “Meals on Wheels!” A petite woman opened the door. Thanking the deliveryman with a shy grin, she took the food and disappeared back into her apartment. Ostmann returned to his car. Ignoring the electronic reminders to buckle his seat belt, he headed east to Intervale Avenue. “Some people loiter about, but I usually just say, ‘Hi, how you doing?’ You’ve got the hot meals, and you don’t want them going cold,” said the volunteer driver. Burlington has one of state’s largest Meals on Wheels programs. With funding from the Older Americans Act, the program delivers free, well-balanced meals to fixed- and low-income seniors. Five days a week, a skeleton staff arrives before the crack of dawn to begin cooking. By midmorning, they hand the meals to drivers who spread out across the city and into South Burlington, Shelburne, Charlotte, Winooski and Colchester. Ostmann has been driving two of the Burlington routes for a year. Tall and white-bearded, the 75-year-old is more senior than some of his clients. But he’s spry and, as a retired geriatric nurse, goes about the job with an air of cordial professionalism. Despite his goal to keep encounters brief, Ostmann inevitably gets waylaid by a few conversations on the morning ride. “The big man takes care of me,” said Theron Blaisdell, also 75, who rents a small apartment off Pearl Street. Blaisdell, a Stowe native, first got on the meal program five years ago after pneumonia parked him in Fletcher Allen Health Care for more than two months. Upon his release, a social worker gave him the options of entering a rehab facility or staying in a hotel on Shelburne Road and signing up for Meals on Wheels. A veteran of the Korean and Vietnam wars who was homeless for many years, Blaisdell chose the latter. It was a temporary situation until he could find his own place. But the food offerings aren’t what they used to be. After budget cuts from the federal sequestration earlier this year, the White House estimated that four million fewer meals would be delivered in 2013. The Meals on Wheels Association of America suggests that number may be closer to 19 million. In many states, that has resulted in waiting lists. But in Vermont, where home-delivered nutrition services are set to lose $52,000 — a 5 percent drop — Meals on Wheels has taken a different approach. An aging population, rising gas prices and a drop in donations haven’t helped the cause. But the program’s administrators argue for its preventive value. “People want to stay out of the hospital and nursing home. They want to be in their old home, around their old things,” said Burlington Meals on Wheels director Peter Carmolli. “That’s why we exist. We can feed one person for a whole year for less than the cost of one day in the hospital.” Meal deliveries may be the only time clients interact with another person, Carmolli added. En route back to the Burlington Meals on Wheels headquarters at Cathedral Square, Ostmann launched into a story that explained his own interest in volunteering. Although his parents were German, his dad had lived in Virginia at the time Herbert Hoover was stepping up relief efforts after World War I. Later, Ostmann’s father would die in World War II as a soldier in the German army. But remembering her husband’s stories, Ostmann’s mother — who had seen much hunger between the two wars — moved her family to the U.S. in 1950.